April Painter, board certified family nurse practitioner, initially joined the Blue Ridge team as an RN in 2008 and later transitioned into her current role as a practitioner in 2012. Although a native of Texas, April has spent most of her life in the beautiful hills of Northeast Tennessee. She has over ten years of combined nursing experience. 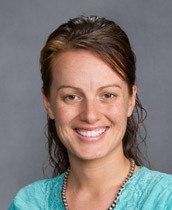 April received her Bachelor of Science in Nursing from King University in Bristol, TN and obtained her Master of Science in Nursing from Vanderbilt University. She is a member of the American Academy of Nurse Practitioners and CMDA. With a background in pediatric nursing, caring for children is just one of the many aspects April enjoys about family practice and the joys of treating patients of all ages. Her other special interests include women’s health, health maintenance, and preventive medicine. She feels that primary care allows her to develop relationships with her patients that foster good communication and address not only the physical needs, but also the emotional and spiritual. April feels blessed to have participated in multiple mission trips that include Mexico, Haiti, and different areas of Africa. During her free time April, along with her wonderful husband, enjoys outdoor activities to include hiking, biking, and running. She also loves time spent with family and friends, and has a passion for traveling.